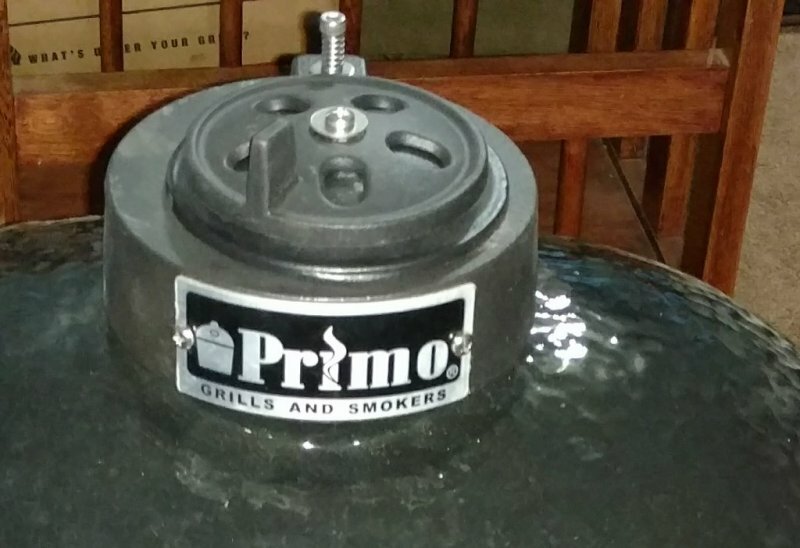 My Primo Oval Jr is the first kamado I've owned that had a daisy wheel top vent. I hate the daisy wheel and think it's an overall bad solution for a top vent. It does allow precise vent control but has two inherent issues. 1) A large percent of the time your top vent adjustment will change when you open the dome due to the weight of the daisy wheel parts. They tried to fix this with a spring loaded screw but it doesn't really work. 2) If you're cooking out in the open and a thunderstorm rolls through some amount of water is going into your grill. I don't see this as a major issue but who wants that if another top vent design is available. A Smokeware Chimney Cap solves both of these problems. 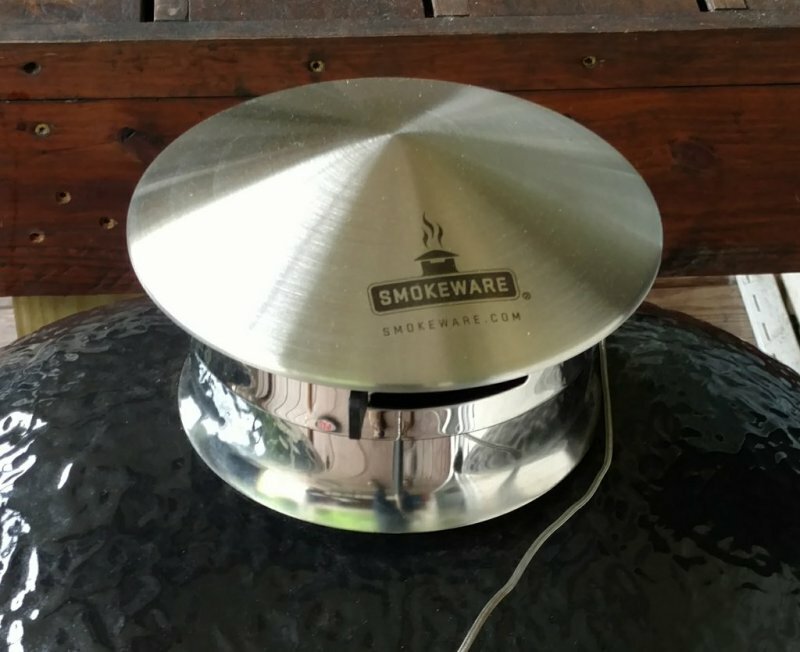 Smokeware sells a rubber adapter gasket to allow their Chimney Cap to be installed on a Jr sized kamado with a smaller diameter vent collar. 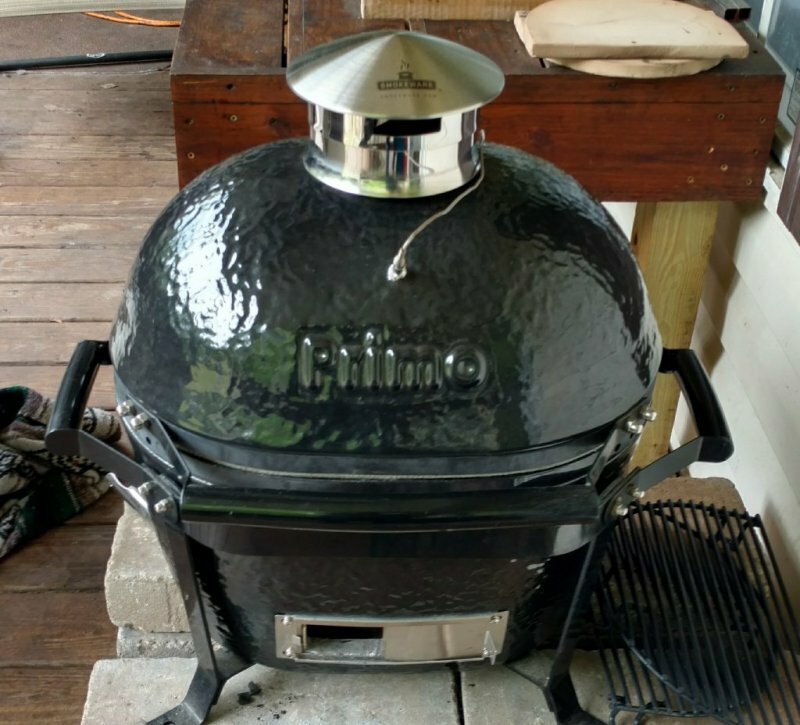 I had the Chimney Cap but I didn't have the gasket so being the impatient person I am I came up with a different solution. 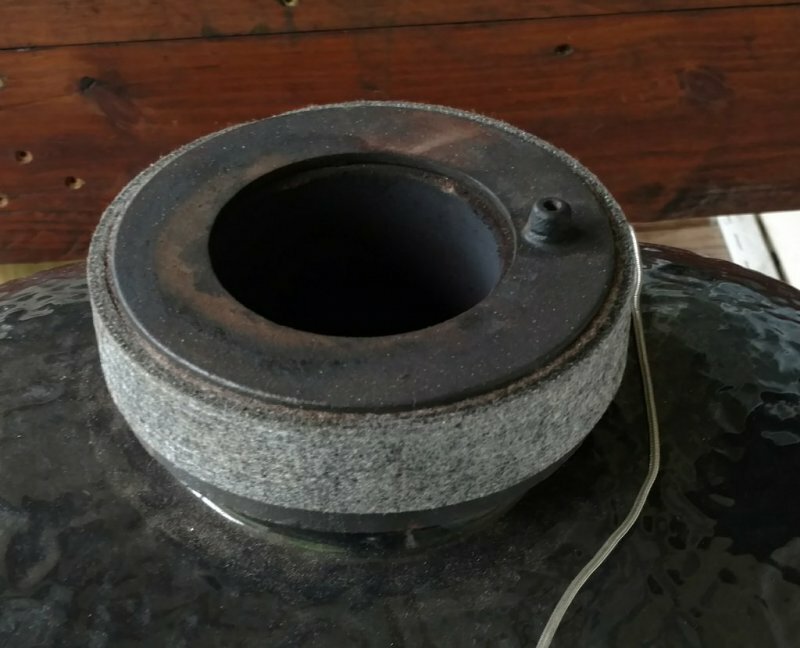 Here is the original Oval Jr top vent with daisy wheel. I removed the daisy wheel and front name plate. I wrapped some extra gasket material around the original top vent piece. The chimney cap slides on snug. Yea I'm now a happy camper ready to take the oval Jr down to my sister's house for vacation this summer (FL afternoon thunderstorms highly likely). Looks good on it and your fix works and saves you a few dollars! 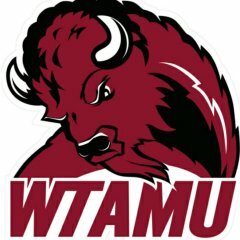 TY Scott, very happy with the solution. does it run to monitor (SmoBot, FlameBoss, or similar)? cool solution... i will have to check out their website, so thanks for the info! That's actually a Thermoworks Smoke probe so I can monitor my dome temperature remotely. All my kamados are setup with that. Even my WFO has a remote monitoring thermometer. The best upgrade I've done to the kamados to date. I highly recommend it.